A funeral Mass will be offered March 13, 11 a.m., at St. Mary's Church, Albany, for Rev. James Lefebvre, who died March 6. He was 83 and had been a priest of the Albany Diocese for almost 59 years. A native of Montreal, Canada, he attended St. Mary's School in Little Falls and Siena College in Loudonville. In priesthood, he served at St. Francis de Sales parish, Troy; St. Patrick's, Ravena; St. Jean de Baptiste, Troy (while teaching at Catholic Central High); Blessed Sacrament, Hague; St. Patrick's, Cohoes; St. Joseph's, Broadalbin; and Sacred Heart, Watervliet. He was also on the faculty and principal of St. Joseph's Academy, Albany, and chaplain at Resurrection Rest Home in Castleton. In addition, he served on the diocesan Priests' Personnel Board and was a member of other civic boards and commissions. Father Lefebvre's longest assignments were at St. Mary's parish in Albany -- he came to the parish in 1985 and was still serving as pastor emeritus in retirement -- and his 55 years as chaplain to the Albany Police Department. He also spent decades as a chaplain for the FBI and the Northeast Chiefs of Police Association. Father Lefebvre always took pride in serving at St. Mary's, the oldest parish in the Albany Diocese and the second-oldest in New York State. He pointed to the generations of families who attended the circa-1796 parish, and he worked hard at ministering not just to parishioners, but to state workers and others who stopped by. The parish's downtown Albany location, he said, made it "a gold mine for evangelization." If priesthood was Father Lefebvre's overall vocation, his specific call was to serve people in law enforcement. He referred to the police department as a parish; many Catholic officers attended St. Mary's. Father Lefebvre always said police officers embodied the biblical Good Samaritan. He walked with them through traumas that shook them to the core and rode along with them to deal with hostage situations, violence, murders, suicides and other crimes, including some that resulted in the death of police. Countless times, he gave last rites at crime scenes; every year, he led a memorial service for fallen officers throughout New York State. His dedicated pastoral presence earned Father Lefebvre many friends in the department and in local and state government. Retired Albany police chief Robert Wolfgang once told The Evangelist that a police chaplain is a combination of a pastor, spiritual director, counselor and honorary officer. Father Lefebvre, he added, was "an Employee Assistance Program all wrapped into one individual." Last year, Father Lefebvre submitted an opinion column to The Evangelist, titled, "A police chaplain on the Jericho road." He was referring to the road on which the Good Samaritan met a traveler who had been robbed, beaten and left for dead. "Every one of us is on a journey called life," Father Lefebvre reflected. "Often, to take a shortcut to our destiny, we happen to travel on the Jericho road. "As it happens, we become victims. But on this Jericho road, there happens to be traveling a Samaritan: Every day, all law enforcement people must travel this way. "The officers care for fellow travelers. They understand that, in the end, they will be judged not by the creed they held, but by the life they lived. A chaplain must walk with these Samaritans on the Jericho road to remind them of the story told by Christ. "Being a police chaplain is a confrontation with one's faith in the middle of a world that cries out in pain, anger, agony and frustration. It is a calling that comes from the Jericho road and seeks the answer to the question: 'Who is my neighbor?'" Years ago, when he was marking an anniversary of priesthood, Father Lefebvre was asked to share a thought about religious life. He said that, in the end, the "joy, laughter and memories remain. "Hopefully, we carried out the commitment to serve Christ and His people during the special moments of their lives," he said. "Hopefully, we made a little contribution to the greater good." Survivors include a sister, Audette Louise Ferraro of Little Falls. Interment will be at St. Agnes Cemetery, Menands. 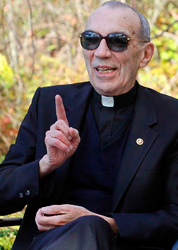 Father Lebvre was a living example of one who portrayed the image of the Good Shepherd as Priest, Pastor, Chaplain and Friend depending on the person in front of him. During that span of time, you were the most important person in his life and you not only knew, but you felt it. The burden you may have been experiencing was lightened by his encouragement and loving concern. May the peace that Father Lefebvre gave to others reward him with eternal peace. This comment has been hidden due to low approval.